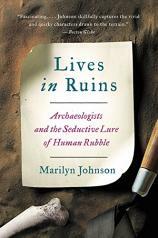 Despite the ominous title of Marilyn Johnson’s LIVES IN RUINS: Archaeologists and the Seductive Lure of Human Rubble, this experiential memoir finds life amid the rubble of archaeology. Johnson doesn’t take up a trowel and spade to shine light on the long-buried treasures of the ancient world. Instead, she concentrates on reconstructing an anthropological portrait of the most mysterious character of all: the Archaeologist. At the very beginning of LIVES IN RUINS, Johnson expresses her desire to throw out all the obscure scientific terms that separate the archaeologists from the laymen. She wants to find “the essential character of The Archaeologist.” I found that assumption --- that a universal character called “The Archaeologist” even exists, that all experts in this widely diverse field can be lumped into one whip-wielding tomb raider --- to be extremely problematic. "In the process of carving out her own archaeological experience, Johnson digs deep and comes up with a sparkling gem. The book shines brightest when the author removes herself from the narrative and lets the true characters --- the archaeologists themselves --- take the spotlight." As I dove further into Johnson’s own archaeological adventures, I realized that the author didn’t keep this archetype on a shelf like a dusty, time-honored artifact. Instead, she presented a hypothetical image that she then proceeded to re-mold like a piece of river clay. She changed and revised “The Archaeologist” as she met more professionals, attended field schools, tagged along on excavations, and listened in on lectures. Like Johnson, the reader learns that there is no single “Archaeologist,” but a plethora of characters. Johnson learns as much about the archaeologists themselves as the techniques of their work. She peppers her narrative with the unforgettable characters she uncovers, whose quips and personalities pop off the page. Professor John Shea of Stony Brook University, one of whose classes Johnson audits, is a quick-as-a-whip paleoarchaeologist who specializes in lithics (stone tools). Under his guidance, Johnson explores the tangled branches of the human family tree, crafts her own arrowheads, and helps butcher and cook a lamb. But archaeology isn’t just a relic of the past. The author creates her most brilliant fresco when describing the empress of underwater archaeology, Kathy Abbass. The imperious head of the Rhode Island Marine Archaeology Project (RIMAP) rules her domain with an iron anchor, but also sheds valuable light on the problems modern archaeologists face. Along with Joan Breton Connelly, a New York University professor who excavates on Cyprus, Abbass unearths the harsh reality of the present and future generations of archaeologists. In today’s world, grants to excavate and university teaching postings are few and far between. Forbes named archaeology and anthropology the worst college majors, thanks to grim unemployment percentages and earnings in those fields. Abbass lives from paycheck to paycheck, while Grant Gilmore, head of a Caribbean archaeological center where Johnson attends field school, is forced to move in with his in-laws for an extended period of time. Despite the unending need for excavation and conservation, archaeologists can’t get work or make money. Period. In the process of carving out her own archaeological experience, Johnson digs deep and comes up with a sparkling gem. The book shines brightest when the author removes herself from the narrative and lets the true characters --- the archaeologists themselves --- take the spotlight.